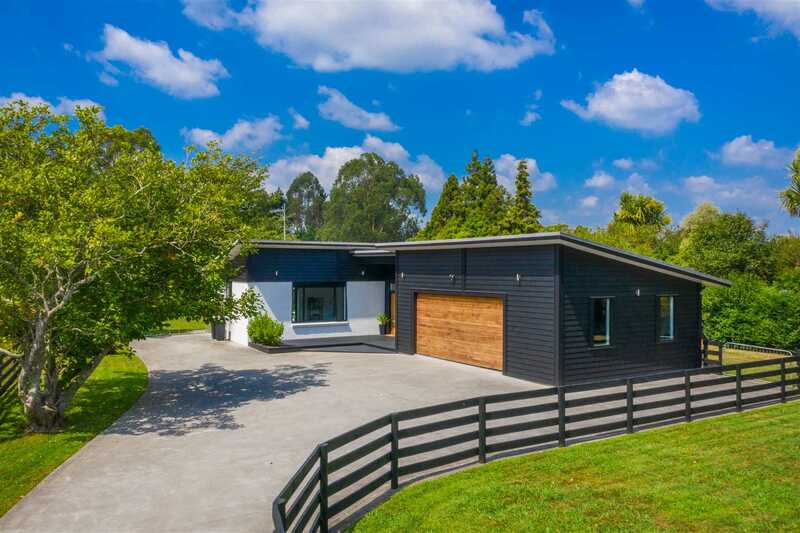 This modern plaster over brick property is a stunning example of a completely refurbished home, nestled in the popular village of Tamahere, only a short distance to Hamilton City. This much-loved family home was renovated to a high specification with the intension of staying; but plans have changed and the vendors are heading off overseas. This home boasts 4 decent sized bedrooms plus an office and is situated on a manageable sized section of 1629m2 which offers ample space for kids and pets to play. The kitchen is open plan with the dining & living area and boasts a stone bench top, gas cooking, ample storage and breakfast bar area. The main bathroom is beautifully presented with a tiled shower, double vanity and freestanding bathtub. The house has been re-wired and had LED downlights installed throughout. There is a ducted heating/ air conditioning unit and new double glazed windows throughout. Outside you can enjoy the flow from the living area onto a concreted entertainment area, which is an ideal spot for BBQs. The property is on rainwater tank and has a trickle feed connection to town supply. Zoned for top schooling including Matangi Primary, Berkley Intermediate and Hillcrest High School. Please contact us for a full information pack or to arrange a private viewing.